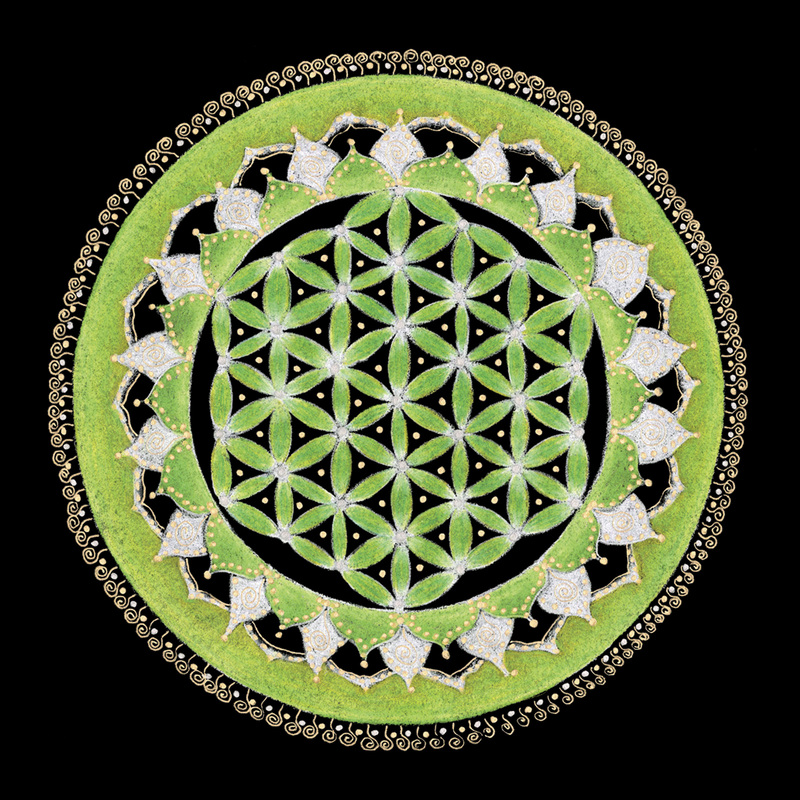 By adding a round of twelve circles to the Seed of Life, the Flower of Life symbol is revealed. This matrix consists of nineteen total interlocking circles. The twelve additional circles represents the 12 aspects of the zodiac, (Greek for “ring of animals”) the epic stories recorded in the stars. The Zodiac defined the twelve months of a solar year during a time when both Solar and Lunar calendars were in use. The 18 circles rotating around the central “one” represents a Saros, which is an 18-year, lunar or solar eclipse cycle. Lunar and solar eclipses mirror each other every nine years, which is called a Sar or half of a Saros. This matrix of 19 interlocking circles (1+6+12=19) also represents a Metonic cycle, or 19 years. It was named for Meton of Athens in 432 BCE, but was already used by Babylonians and Chinese. To keep a 12-month lunar year in pace with the solar year, an intercalary 13th month would have to be added on seven occasions during the nineteen-year period. 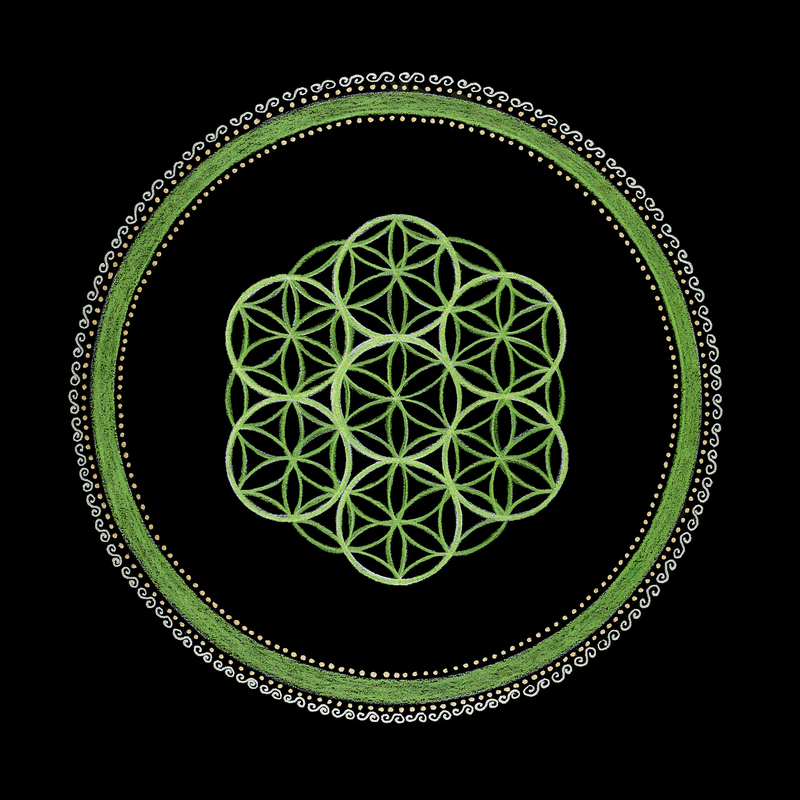 The Flower of Life contains seven independent circles. Seven (7) is a septad or “set” that forms the basis of sacred order and the mystic nature of humans. The Flower of Life pattern has been found throughout the world as a symbol of cosmic order. It represents inner alchemy as the combination of the sacred trinity (3) of spirit, mind and soul with the foundational body (4) made of earth, water, air and fire. The heart is where the soul transmutes body, mind and spirit. The Kabbalistic Tree of Life is first revealed within the Flower of Life symbol. Knowledge of the Tree of Life was strictly forbidden. The Tree of Life represents the mystical journey of the soul as it descends into human form and then transcends to remembering its divine oneness as whole. Leonardo Da Vinci (1452-1519) studied the hidden wisdom of the flower of life. His passion was to link art and science together to create new ideas and ways of seeing. 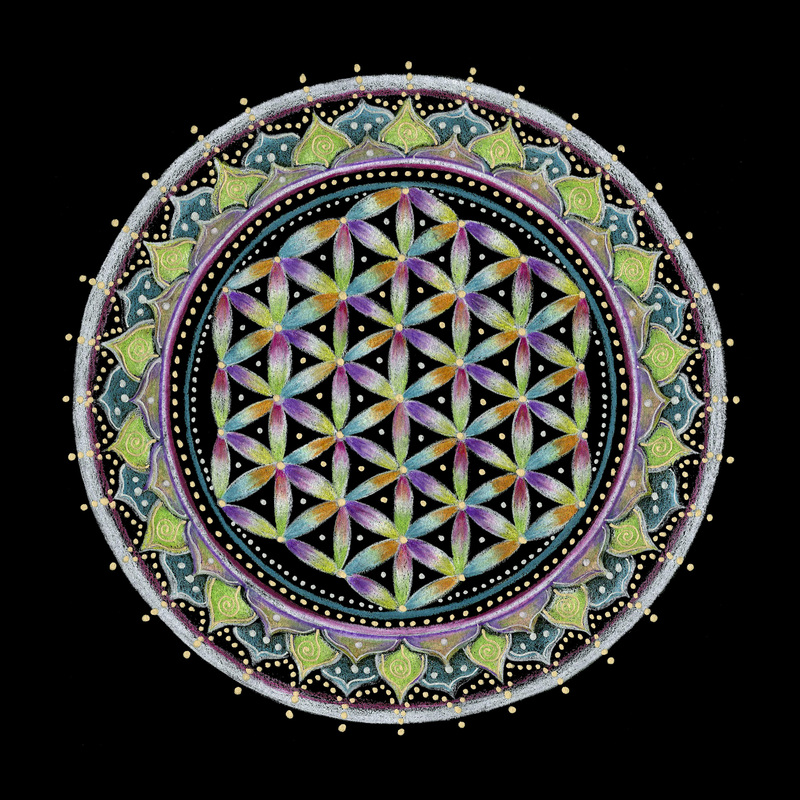 The Flower of Life was a mathematical formula that encouraged him to explore the hidden or esoteric meaning of life. The heart chakra reminds us that to be fully conscious we must see all aspects of the self and love all of our self unconditionally. By loving our self unconditionally, we will know the truth of our soul. Message: Be open to the hidden wisdom in your soul. This wisdom is becoming more accessible as you begin to see with your heart instead of your eyes. Just as you appreciate the gifts of others, it is time to appreciate the gifts within you. A bud is never fully realized if it does not blossom. Now is a time of opening, to honor the person you are becoming. The heart chakra is located in the chest area and is connected to our cardiovascular system. This is the energetic world of our soul, where compassion and unconditional love reside within us. It represents the archetype of the eagle, reminding us to soar above the stories that hold us to see the bigger picture of our lives. 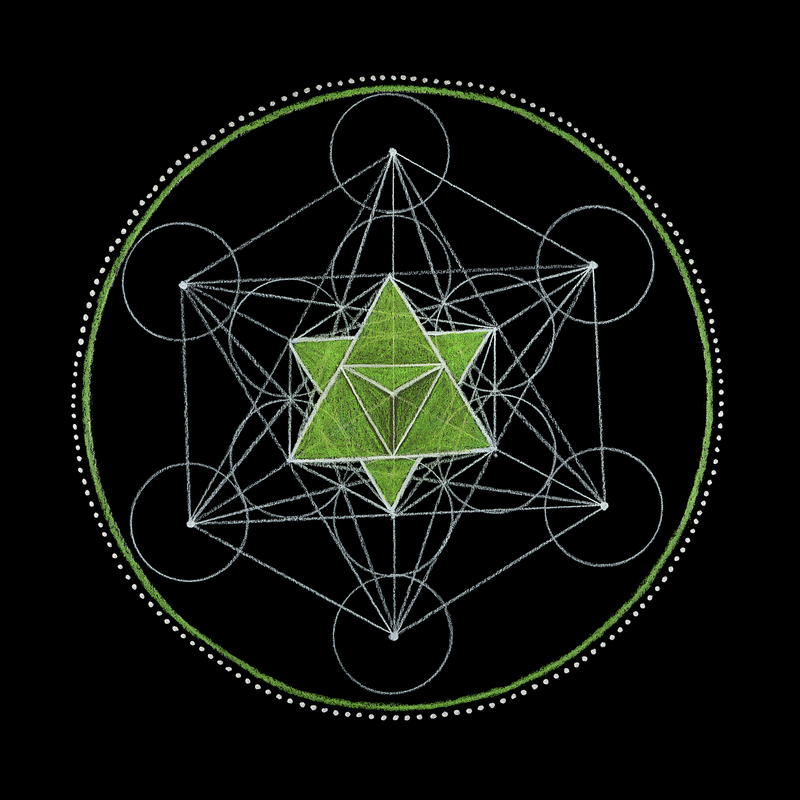 In sacred geometry, it is the flower of life that reveals the essential nature of our being. Its element is love and its belief is founded in the teachings of Buddha. 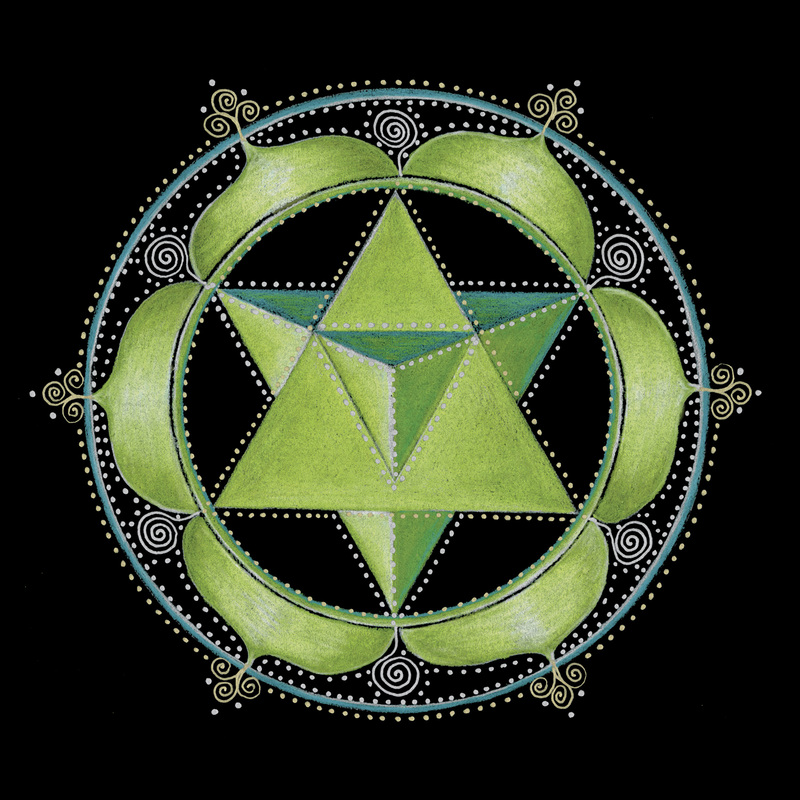 The heart chakra is the center point, the core of who we are. This chakra reminds us that to be fully conscious of the self we must love our self unconditionally. By loving our self unconditionally, we will know the truth of our soul. The star tetrahedron is created when an upward-pointing tetrahedron, representing (fire, air, blade) merges with a downward-facing tetrahedron (water, earth, chalice.) Interlocked and interpenetrating, they represent love and strife as the human nature of the soul. Empedocles (Greek philosopher circa 490–430BCE) identified the four forces of nature: fire, air, water and earth. He saw that these forces were eternally brought into union and separated through love and strife. Love is the power that attracts different forms of matter while strife separates them. Just as we can energetically feel our heart open and expand in the presence of profound love, we can feel our heart close when surrounded by chaos. The heart holds the universal language of love and is felt without saying a word. Kindness and compassion are two of the most powerful qualities that create loving relationships. Message: Love and strife are both influencing your life right now. Allow this flow to occur and become conscious of what needs your attention. Love involves making peace within you before making peace with other people or situations that are causing you strife. Seek out those who are real enough to be honest with you, and love you for who you are and who you are becoming. The heart is the place of the conscious self. The heart generates an electromagnetic field that is 60 times greater than the brain. This subtle yet powerful energy field can be felt several feet away from a person’s body between individuals. The heart is a sensory organ that has the ability to learn, remember and make independent decisions. The conscious self is aware of this dynamic and engages the heart in an ongoing dialogue with the rest of the body. Shamans and seers, “see with their hearts instead of their eyes.” The conscious self sees the heart and soul as one. To become fully conscious requires one to see the bigger picture of their life. We need to look at the wounded parts of ourself as well as the healed aspects of life. If we choose to only see our happy memories we limit our awareness of our full potential. Consciousness from the heart requires compassion and non-judgment in order to see the wisdom or insight that come from challenging experiences. By seeing our selves as whole is to be conscious of who we are, who we have been and who we are becoming. Message: Become more conscious of yourself by connecting with your heart instead of your mind. See with your heart instead of your eyes. Trust the inner voice deep in your soul and connect to your true self. Embrace your life and all of its potential. Be fully aware of any opportunities for love that may be unfolding for you right now. The Soul’s Essence is found within the heart and the Flower of Life matrix. This essence is shared through the silent language of our soul. The essential nature of being human is to share our life with others. Our soul’s essence transcends ordinary reality by relaying emotions without words. Flowers have often represented the silent language of the soul for they awaken the essence of love and wonder within us. The language of flowers was used to convey secret messages that could not be spoken. These cryptic messages often pertained to love and lovers. Message: Visualize your soul as a flower by allowing yourself to blossom and be seen. Listen to the silent language of your soul and see that in the center it is filled with love. Your soul’s essence is to be seen and shared. Life is a reflection of you and you are the one creating that reflection. Embrace your soul’s essence as you release, renew, rebirth and rejoice in the life and love you are sharing!